Following are the important questions for chromosomal aberration. students can prepare these questions for their test and exam. 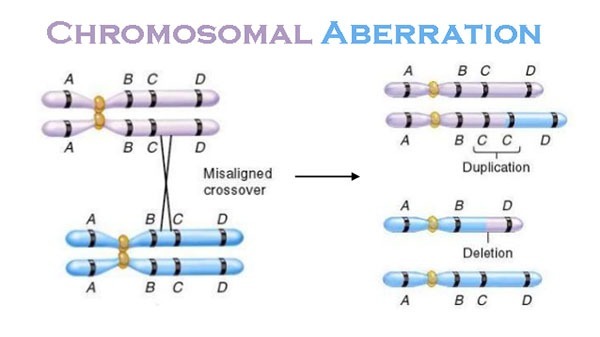 What are chromosomal aberration? How are they caused? Ans: Any numerical or structural change in the usual chromosome complement of a cell or organism is called chromosome aberration. There are two types of chromosomal aberrations Changes in the number of chromosomes: Aneuploidy and euploidy Changes in structure of chromosome: deficiency (deletion), duplication, inversion and translocation. What is aneuploidy? How is it caused? Ans: The random abnormal number of chromosomes in the animals is called as aneuploidy. Aneuploidy is mostly caused by nondisjunction. Ans: If a chromosome is missing the aneuploidy is called monosomic. Therefore, the cell has 2n – 1 chromosomes. What is mosaic Mosaic trisomy? Give example? Ans: In this case, an extra chromosomal material exists in some of the organism’s cells. The most common types of trisomy that survive without spontaneous abortion in humans are: Trisomy 21 (Down syndrome). Ans: If the chromosome is present in tetrad form in the fertilized egg the aneuploid cell is called tetrasomics for that chromosome. The cell has a total of 2n + 2 chromosomes. What are the effects of aneuploidy? Ans: Effects of Aneuploidy: Aneuploidy is produced in sperm or egg, Later, it is transmitted to the zygote. Mitosis transmits the aneuploidy to all embryonic cells. Such organism may not survive. If the organism survives, it becomes abnormal. Nondisjunction can also occur during mitosis. The early aneuploid condition is passed to a large number of cells by mitosis. It has greater effect on the organism. Ans: A condition in which the organisms have more than two complete sets of chromosomes is called polyploidy. Differentiate between autopolyploidy and alloploidy? Ans: Autopolyploids are polyploids in with chromosomes derived from a single species. Allopolyploids are polyploids with chromosomes derived from different species. Ans: Triticale is an example of an allopolyploid. It has six chromosome sets. Four are taken from wheat (Triticum turgidum) and two are taken from rye (Secale cereale). Ans: Tetraploid crops: wheat, maize, cotton, potato, cabbage, leek, tobacco; peanut. Give comparison of Comparison of aneuploidy and polyploidy? Differentiate between Interstitial deletions and Terminal deletion? Ans: In case of interstitial deletion, internal part of a chromosome is missing. In case of terminal deletion, there is only one break and the homologous chromosome fail to rejoin). Thus, tip of the chromosome is lost in cell division. What is Cri du chant syndrome? Ans: A deletion of part of the short arm of chromosome 5 results in Cri du chat. It is also known as “cry of the cat” syndrome. It is found in 1 in 50,000 live births. The surviving infants have a distinctive cry, severe mental retardation, and shortened life span. What is pseudo dominance? How is it caused? Ans: Heterozygous deletion may cause pseudo-dominance. In this case, dominant allele is missing. Therefore, recessive allele expresses itself. Ans: In this case, the fragment joins to the homologous chromosome with a duplication of genes. It adds one or more gene in the chromosome. Therefore, the organism carries same gene repeated in its haploid chromosome. Ans: In this case, the duplication is adjacent to the normal chromosome. It has same order as the original order. It is believed that the homologous chromosomes overlap each other. Therefore, the segments break simultaneously at different points. Ans: In some cases, part of chromosomes bends back and join with the duplicated sequence on the same chromosome. Such individuals with two chromosomal types are called heterokaryotypic. This duplication is called heterokaryotypic duplication. What are paralogs and orthoglous genes? Ans: The two genes that exist after a gene duplication event are called paralogs. Paralogs code for proteins with a different function and structure. This is different from orthologous genes. Ortholgous genes code for proteins with similar functions but exist in different species. Differentiate between Paracentric and Paracentric inversions? Differentiate between Reciprocal and Robertsonian translocations? Ans: It is caused due to an exchange of material between non-homologous chromosomes. Reciprocal translocations are found in about 1 in 600 newborns. Robertsonian translocations of rearrangement involves two acrocentric chromosomes. These chromosomes fuse near the centromere region with loss of the short arms.